Fungal infections are notorious for piggybacking on other diseases. For this reason, they affect diverse patient groups spread over different domains. Anyone bent on reducing the scourge of invasive fungal infections would invariably have to be an advocate and take the message to Respiratory physicians, intensivists, surgeons, ophthalmologists and virtually any specialty you can think of. 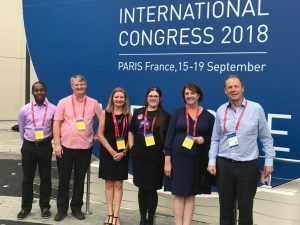 This is why it is so gratifying to learn that The National Aspergillocis Centre, University of Manchester were in attendance at The European Respiratory Society International Congress which held in Paris France from September 15-19. Dr Akan Otu, vice president of MMSN was part of this team. It behoves on members to take the message to their respective institutions and professional bodies. This way the message will truly spread and take effect. National Aspergillosis Centre, UoM delegate to the ERS International Congress in Paris. Dr Akan Otu and Professor David Denning flank the group on the left and right respectively. Previous Previous post: MARKURDI HOSTS MMSN CRYPTOCOCCAL SCREENING TRAINING PROGRAMME.